Last week I set up a Facebook page that is just about cartoons, so that anyone interested in seeing my work on that platform doesn't have to look at all the other stuff (dimly remembered nights in the pub, embarrassing childhood photos etc). 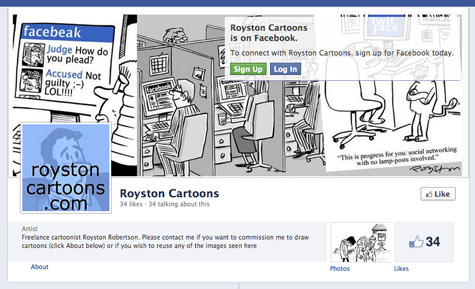 The address, logically enough is facebook.com/roystoncartoons and it's a public site, so you don't need to be my "friend" to view it. So in the needy way that Facebook makes us behave, I'll say please visit and LIKE it!